Discovery chases the second signal to a planet in the Beta Quadrant, and are surprised to find it inhabited by a 200-year-old colony of humans. With Pike leading a team on the surface, the crew faces a new crisis in orbit. Last edited by GateWorld; January 30th, 2019 at 10:26 PM. That was very cool. The whole plot felt very classic trek and while I wasn't expecting or hoping to see the spore drive again so soon it was actually kinda nice to see it in action. The red angels are becoming somewhat interesting in what these red bursts seem to be. Directing them to places where there is an imminent risk of death. And yet the angels evidently have the power to act on their own, so is the Discovery actually intervening before the angels get a chance to? Stuff with Tilly is interesting but a bit to early to predict what's happening with her still. Except maybe that an entity as part of the spore drive has inhabited her. Although from what Stamets was saying about seeing Hugh in the network maybe this is actually her dead school friend communicating with her. Saru is awesome when he gets to captain. Fantastic to see a more ensemble piece with both Detmer and Owo. Star Trek fans like me were continually told that episonic exploration episode like these wouldn't work in the modern TV landscape, yet we are with both The Orville and STD doing the episodes we wanted and doing them well. An these episodes are getting better reviews from fans as well. Not sure why the producers continually whining us up with the return of the Klingons at the end of the episode, that seem to be one message they didn't get from season 1, no one like the new Klingons. Okay not no one but hardly anyone did like the new Klingons. First time we seen WW3 in action on screen apart from Q playing games. I hope we get more from this era. How many aliens have involvement with Earth history, earth seem to have been a magnet for them. I'm with P-90_177 in not being saw what going on with Tilly but it did seem like delusion was trying to help Tilly. Like Stamets one help him navigate back home. An we know the asteroid could act as a interface with the spore drive and presumably the network. Which leave me more along the lines of this being some sort of alien entity trying to help the crew or make contact with the crew. It was a really nicely written and directed episode, which was even better than the 2x01. I loved the little informations about the main and secondary characters and even the story was interesting. Honestly I was shocked about the WestWorld crossover when I have seen the church, but this was different. I really loved the concept how the church was "enlightened" at the end, which has meant not just physically, but spiritually. What I couldn't really understand if the red bursts just show up in the galaxy, then how could they find only the second one? I mean they have put the red dots on the map, but actually the events haven't happened yet or were the events of 2x01 and 2x02 are newer ones? I have a wild idea about the red angels or whatever they are. I believe the underworld or an other timeline try to communicate with this reality. Stamets could see his dead partner, now it looks like Tilly has seen her old friend. I am sure it will be death related the whole visions, so Spock and Burnham must have experienced something together in the past. I wouldn't be surprised if the whole plot is about bringing back the doctor character as an AI. Or maybe Lorca (or our Lorca) is behind the the whole thing. When he has fallen into the star, he or his soul could have been teleported into an other reality. Maybe there is more than one mirror universe. My other idea was what if the "original" timeline and the reboot movies timeline (Kelvin timeline how it is called?) will be merged somehow? So maybe Burnham and Spock are affected to prevent the destruction of Vulcan in the near future. I don't know, I am just guessing. I still think episodic tv like we had back in the 90’s doesn’t really work anymore. Orville is kind of the exception that proves the rule as it’s designed to be a nostalgic kind of show. What I do like about what Disco is doing this year though is that it’s more like how Supernatural or the DC superhero shows do things. They are episodic and have a threat which is largely dealt with in one episode but they have a long term plot running alongside that at the same time that they have to try to deal with. i think it certainly suits the plot they have this season. As for the Klingons I’m actually really looking forward to seeing what’s going on in the Empire. Plus hopefully they’ll work better with the changes they’re introducing again. I doubt they’d merge universes. CBS still owns TV Trek and Paramount still owns movie trek. That isn’t going to change for a while. I do wonder if the angels are to do with the spore network. However at the minute I am thinking they are some kind of heralds of disaster who try to save people, or have done in the past, but now Starfleet is intervening in the form of Discovery. So the question I have is if Disco is being led to those sites so that they can take action in which case i wonder why can’t the Angels take direct action any more. OR is Discovery arriving an unintended happenstance. And that Starfleet isn’t meant to be detecting the red bursts. In which case do they think they’re helping when in reality they are acting in a way that is counter to the Angel’s wishes. Please do me a huge favour and help me be with the love of my life. ST neophyte here but... Discovery is far away from episodic in my opinion, even if S02 seems to have more defined episodes there is still a major arc ongoing, unless I'm the only one thinking that? If it was episodic I wouldn't watch it, as Knowles2 said, this pattern doesn't work anymore. I do love P90's theory on the Angels appearing at imminent death moments, what I'm still unsure about is if their intentions are benevolent or malevolent. I mean sure they saved that little church and its people, but they kind of sent them... in the middle of absolutely nowhere! I don’t want to be human. I want to see gamma rays, I want to hear X-rays, and I want to smell dark matter. Do you see the absurdity of what I am? I can’t even express these things properly, because I have to—I have to conceptualize complex ideas in this stupid, limiting spoken language, but I know I want to reach out with something other than these prehensile paws, and feel the solar wind of a supernova flowing over me. I’m a machine, and I can know much more. Pretty sure that's not in next week's preview. That was in the "coming this season" preview. I think self-contained episodic television can still work in general, but there is a definite lean toward long story arcs among the general TV-consuming public. But I think as genre fans, we in particular are even more inclined toward the long-form storytelling. 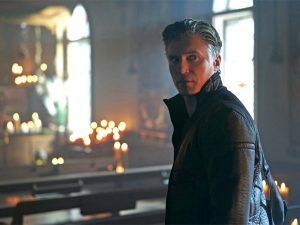 I don't know if it's because we've been watching and getting more and more of it ever since Babylon 5's debut 25 years ago, or because we're the kind of people who will invest in a multi-book novel series, or what, but we definitely seem to the kind of people who skew toward preferring long story arcs. But to get back on-topic, I think there's an exactly 0% chance of them trying to do anything involving the Kelvin Timeline (beyond subtle homages from the production team). As was stated above, it's Paramount that owns the rights to Trek films while CBS holds the TV rights--and the two companies, for a multitude of longstanding reasons, just do not get along. Fun fact: the name "Kelvin Timeline," for the JJverse films, was actually coined by the MMORPG game Star Trek Online, and which has been the name it's been referred to in official (real-world) sources ever since. Except it look like the angel was attacking the church and the soldiers were running away from it. I do think we will be revisiting this colony again in a future episode. An we will probably come to see more of what happen in that church and the surrounding area. Why would an alien even be interested in saving a small church, when tens of millions of lives were at risk. I wouldn't be surprised if the angel was trying to destroying another alien being and to escape the angel, the being beamed everyone to this new planet. Only two species that know that use teleportation technology over long range distances, the dominion (over a few light years) and the species who sent Gary Seven to Earth over a unknown number of light years. Only the last one is known to have interacted with Earth. An we know who was behind Gary Seven organisation had recruited species from all over the galaxy. Another possibility is what if this a war between species that live naturally in the Mycelium network. One that think that the only way to keep the network safe is by destroying all life in the galaxy, another faction trying to stop it. Doesn't explain everything but what if these being have the ability to travel in time, they are studying earth in the past to understand humans today. The faction that move humans to new eden just to save from this other group who wanted to see how humans react to a superior force. Then they send a signal to discovery which led them to the asteroid, which was not only a tool needed to save new eden but serve as a conduit between humans the faction trying to save life in the galaxy so they can work together , instead of relying on the red signals, control by the other faction. Last edited by knowles2; January 28th, 2019 at 07:50 PM. The notion that the aliens were attacking the church doesn’t track with the planet’s mythology though. They revere the angels for saving them from WWIII. Now if the Red Angel was attacking the troops then the descendants would have passed down that the angel was an aggressor. I think what we’re seeing in the log is that the church was under attack from the enemy in the war (some sort of Far Eastern alliance if I remember my lore. I could be wrong though) and then the Angel showed up and saved them by taking the church away. The reason for not intervening in the entire war or saving more people could simply be a case of resources. They can’t save everyone. If you say grab 30000 people and throw them on another world then there is actually a greater risk that many of those people will die or that divisions will occur and that group will fight among themselves much sooner. If you take a small group of just a couple of hundred though then that group has a better chance of being able to ration the early resources they find and remain harmonious for much longer. Ultimately we need more evidence. But so far all we know is that the energy bursts have directed discovery to a crashed Starfleet ship with a dying crew, and a planet which had a mass of radioactive debris about to hit it. We also know the red angels showed up when Burnham was under mortal threat, and when those troops were under mortal threat. The one mentioned in First Contact was the Eastern Coalition, though it never specified what “east” it refers to (or who the other faction was, for that matter). One thing that caught my notice was the reference to WW3 on the bridge of Discovery, noting the 600 million dead—or rather, how it was Riker (played by Frakes, who directed this episode!) that made the exact same casualty count observation in First Contact. Good point. I didn’t think of that. Except neither the Vorlons nor the Shadows had the lower races best interest in mind. As a matter of fact, shortly after Kosh passed away, the Vorlons didn't think twice before going ahead with their planet killer which would've seen entire innocent civilizations wiped out from existence. I still think this is a great analogy, obviously the intentions of the Angels are TBD, but they might have a grand plan of sort similarly to the Vorlons/Shadows, who knows.